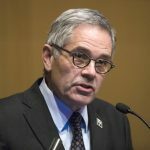 In budget speech, Wolf describes doomsday scenario for Pa.
Democratic Governor Tom Wolf offered up some tough talk for the GOP-controlled Pennsylvania Legislature in his second budget address, scarcely mentioning the details of his proposed $33.3 billion plan. 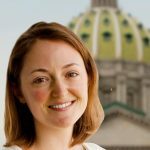 Wolf’s proposal calls for $2.7 billion in new and higher taxes to close a budget gap and funnel more money into education, human services, and mandated spending. But the governor didn’t focus on that in his 25-minute speech to the Legislature. Instead, he described the dire financial position he says the state will be in if his proposals aren’t approved. The state faces a nearly $2 billion deficit, according to the state’s Independent Fiscal Office. Wolf described the consequences of austerity: teacher layoffs, human services program cuts, and higher school property taxes. He offered his own budget proposal as a contrast. The plan would increase funding for K-12 schools and higher education. It would also put more money towards county human services and programs for people with intellectual disabilities. But the administration says most of the new spending is in mandated costs — pensions, health care, human services, and state prisons. To pay for it, Wolf is proposing a slew of taxes he didn’t get last year. The governor is calling for a new levy on natural gas drillers and a hike in the personal income tax. He would expand the sales tax to apply to movie tickets, basic cable services, and digital downloads. The proposal would take the per-pack cigarette tax from $1.60 to $2.60, and apply a 40 percent tax on other tobacco products and e-cigarettes. The plan would also hike taxes on banks and “promotional plays” at casinos, as well as place a surcharge on insurance premiums. Wolf encouraged lawmakers during his Tuesday address to help him find alternative ways to close the budget deficit. But ignoring the deficit, the governor said, should not be an option. 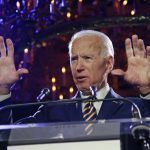 The line prompted thunderous applause from Democrats, but it was met with silent raised eyebrows among Republicans. “I have to update my resume,” quipped Sen. Mario Scavello, R-Monroe. 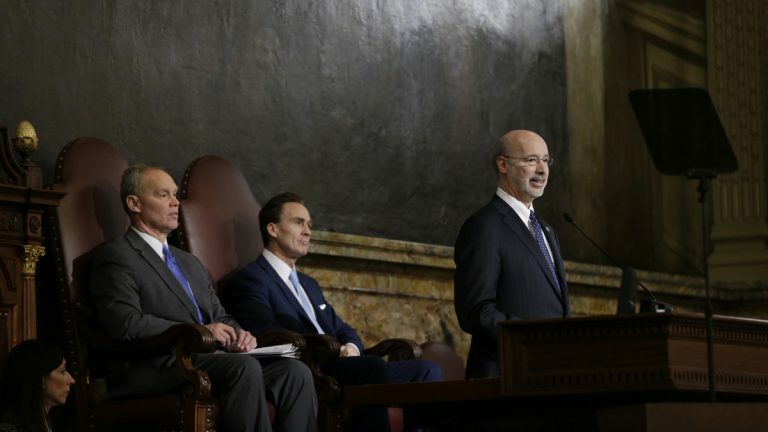 GOP leaders denounced the governor’s speech, accusing Wolf of fear-mongering. For all their dislike of the governor’s tone, Republicans didn’t take on Wolf’s warning about the state’s $2 billion budget deficit. Senate GOP leaders said they’re not sure they agree with that figure, and they’re not saying how they would reduce it. House GOP leaders didn’t say how they would address any spending shortfall, either, though they suggested that if the state has a budget gap, this is not the time to propose additional spending. “I’ve never seen anything quite like this, quite frankly,” said Frankel. He echoed the governor’s hope that lawmakers could return to a tentative budget deal struck late last year. That didn’t seem likely to GOP Senate Majority Leader Jake Corman after the governor’s budget address.